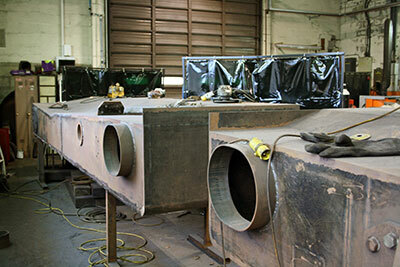 Work is advancing on the four remaining axleboxes for the coupled wheels following completion of the first two. 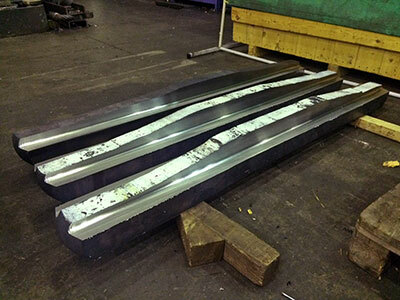 Crossheads are being machined at Mallens and slidebars at Stephenson Engineering. 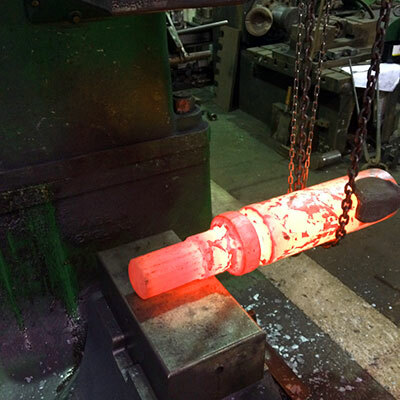 The latter have forged the piston rods and have an order for forging the valve spindles. They will also be manufacturing the expansion links and return cranks. Some components for the hand brake mechanism are being manufactured by Coded Welding Wolverhampton Ltd. The brackets for the reversing shaft bearings are bolted in position and in due course will be riveted to the main frame plates. 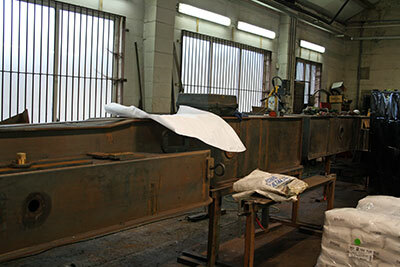 The bearings themselves have gone to Osborne Engineering Ltd. at Cramlington, Northumberland for whitemetalling. We had taken a decision when it came to whitemetalling the axleboxes that it was simpler to send such components out to a specialist contractor rather than equip ourselves with the necessary kit and materials to do the job ourselves. We had a good contractor for this process in the Birmingham area but recently they have decided to cease trading and we have been fortunate to transfer our business to Osborne Engineering ltd. The bulk of the fabrication work on the water tanks at Dinas on the Welsh Highland Railway is complete with just the smaller fiddly bits to finish off. A few days ago the fabricator Gary was working on parts for the filler lid closure mechanisms. Those of you who read my end-of-year notes will remember the rather cryptic allusion to a major development which, readers were assured, would be announced at the end of this month. Well, argh, the announcement is still imminent: it's just that, as I write, we are in the thick of making a important decision, and it has to be the right one. My apologies for this rather damp January squib, but I promise you that it's very important and that you will learn of it first on this website. Don't forget to make a note in your diary that this will be held on Saturday 7th April at 2.00 p.m. in the usual venue, the upstairs lecture theatre at Kidderminster Railway Museum. Please do come along - you don't have to be a member - as this one could prove to be the most momentous to date. Two photos of the water tanks at Dinas on 24th January. Photo: Tony Massau. Three of the four slidebars partly machined. Photo: Robert Stephenson. A hot piston rod forging. Photo: Robert Stephenson.